Monday, July 23rd is going to be another fabulous day at the Lavender Field for Feed a Smile. 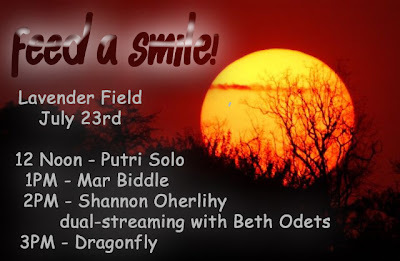 Putri Solo will be taking the stage at 12 noon, followed by an amazing Lavender Field premier of Mar Biddle. And then, last but not least, Dragonfly will be fluttering onstage in the form of Joel. So, please join us as we raise funds to feed the very poor and very real kids in Kenya very real meals.